A lighter is a device designed to produce a flame, usually for the purpose of igniting a cigarette. The very first lighters were converted flintlock gunpowder pistols circa 16th century. Modern lighters were a result of the patenting of ferrocerium in 1903. Ferrocerium produced a spark when struck which ignited the fuel which produced a flame. As a result of this innovation, lighters were easier to manufacture and therefore came into more common usage. Utilitarian lighters were produced in massive quantities as smoking became a popular past time. In addition, decorative lighters were produced in the 1930’s and 40’s (and later) with gold and gem-set cases concealing the flint and fuel. They were an elegant accompaniment to the elaborate cigarette cases of the period. Lighters could take on a variety of interesting shapes, made from a wide assortment of materials and could be decorated with gems, enamel, engraving, even the addition of a watch to the case. 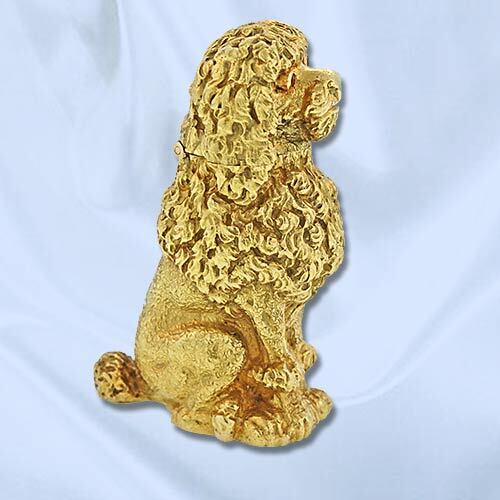 Tiffany & Co. Schlumberger Poodle Lighter. 18k Yellow Gold with Ruby Eyes. 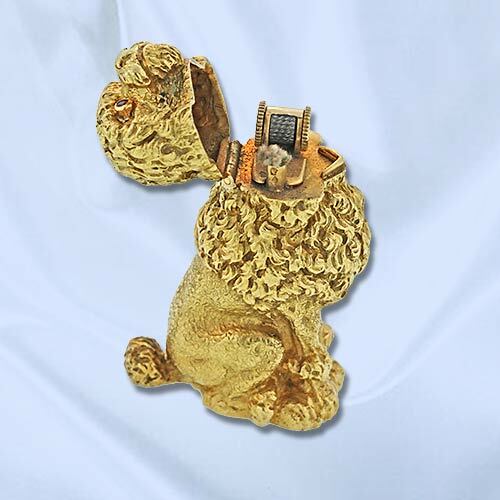 Tiffany & Co. Schlumberger Poodle Lighter – Open. 18k Yellow Gold with Ruby Eyes.